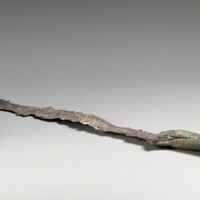 This sword, found in the Greek and Roman art collection of the Metropolitan Museum of Art, originates from the same culture and approximate period of The Last Legion’s version of Excalibur. The film combines Arthuriana and Roman history by positing that the legendary Welsh sword originally belonged to Julius Caesar. While it can be assumed that this theoretical sword would have been more decorated than those belonging to the rank-and-file, the style of late antique weaponry can be quite distinct from swords dating to the early medieval period. Metropolitan Museum of Art, 13.134. 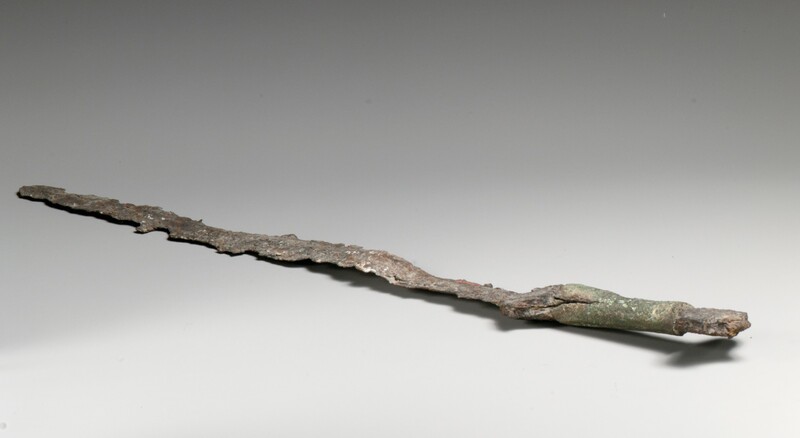 “Iron sword with bronze hilt (c. 2nd century B.C.–1st century A.D.), from Metropolitan Museum of Art. 13.134,” Medieval Hollywood, accessed April 24, 2019, http://medievalhollywood.ace.fordham.edu/items/show/81.